Adult and senior cat food light in fat to support 7 signs of healthy vitality. Specifically formulated for less active cats to maintain a lean body. Antioxidant blend with Vitamin E to help support the immune system of your pet. Crunchy kibbles and tailored mineral levels for healthy teeth. Cat food lovingly developed with vets and over 70 years experience. 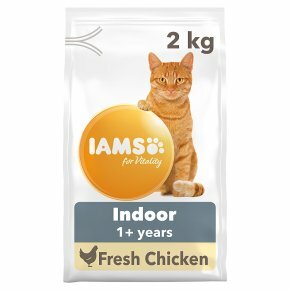 IAMS for Vitality Indoor with Fresh Chicken for adult cats is a 100% complete and balanced food for your indoor cat. With 89% animal protein (out of total protein), no fillers, artificial colours, flavours or GMOs and wheat free recipe (produced in a factory that handles wheat).This formula contains 14% less fat than our adult recipe and is specifically designed for less active cats. It has yucca extract to reduce stool odours and a tailored fibre blend to reduce hairballs. Our delicious recipe for indoor cats is perfect for your pet to stay in good health and maintain a lean body. Only you know your pet's individual character, but IAMS knows the nutrition they need for the 7 signs of healthy vitality. 7 Signs of Healthy Vitality: Healthy Skin & Coat: Omega 3 & 6 to support healthy skin and shiny coat. Healthy Urinary Tract: Formulated to reduce urinary pH. Healthy Teeth: Crunchy kibbles and tailored mineral levels to help reduce tartar build up for healthy teeth. Strong Muscles: High quality animal protein and essential minerals to help maintain strong muscles. Strong Immune System: Antioxidant blend with vitamin E to help support the immune system. Healthy Digestion: Tailored fibre blend including prebiotics and beet pulp for healthy digestion. Healthy Heart: Taurine to nourish the heart.